Where does the enormous energy of a nuclear explosion come from? Amazingly, it comes from the loss of a just small amount of mass within the atoms and subatomic particles at the warhead core when they are either split into lighter elements (fission process) or they are fused together into heavier elements (fusion process). Both of these events cause the transformation of a small amount of mass in each fission or fusion reaction into pure energy, which radiates out of the core with incredible ferocity. The Tsar Bomba thermonuclear test was a 50 MT bomb exploded by the Soviet Union that was capable of destroying everything within a 15 mile radius and giving third degree burns at over 60 miles from the fireball. In a typical fission-based weapon, highly enriched uranium-235 or plutonium-239 is placed in the core of the warhead. 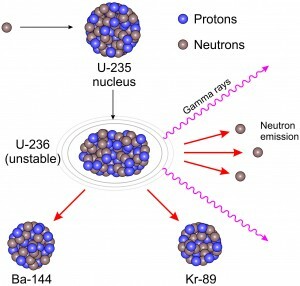 U-235 is a naturally occurring fissile isotope of uranium that can spontaneously split into two smaller elements (mainly barium and krypton, but a number of other fission products are also possible), and combined with the loss of 3 neutrons and the emission of 2 gamma rays. This fission process normally occurs in nature very slowly with a natural half-life of millions of years. However, in highly purified U-235, the radiation from this process will build up enormous heat with considerable neutron and gamma ray emission, and it can be deadly to anyone exposed to it. In highly enriched uranium, the fission process produces great quantities of neutrons and energy. If one of these neutrons hits another nucleus of U-235 and fuses to it, the result will be the formation of the highly unstable U-236 isotope that has a much greater tendency than U-235 to immediately undergo fission with the release of 2 or 3 more neutrons (see illustration). If U-235 is present in high enough purity (enrichment level of at least 80% for weapons grade material), then a chain reaction can occur as neutrons produced from one fissile event bombard another U-235 nucleus to create U-236, which then undergoes rapid fission with release of more neutrons and the process repeats. This continues to occur in highly enriched uranium and creates considerable heat and energy, but it doesn’t spontaneously result in a nuclear explosion. In preparations of U-235 of lower purity (~5%), nuclear power plants can use this heat production to create steam, which then spins turbines to produce electricity. To create a nuclear explosion event, the core of a nuclear weapon must be compressed under extreme pressure to bring the atoms into closer proximity and reach what is known as “critical mass”. Critical mass is the point at which the fission process accelerates out of control and results in an exponential increase in the rate of fission along with explosive energy production. One way of reaching critical mass is to further surround the fissile core with powerful conventional explosives. As these explosives are detonated, they exert a tremendous inward force, which compresses the uranium atoms together at incredible pressures. As the sphere of U-235 is compressed, the neutron density becomes so great that the nuclei of uranium atoms gets hit by neutrons and they then split at an exponentially-increasing rate, causing an uncontrolled chain reaction which spirals into a nuclear explosion. Thus, within a fraction of a second the core of a nuclear weapon can undergo rapid fission and detonate into vast amounts of energy, equal to millions of times beyond what is possible with any conventional explosives alone. The energy that is released from a fission explosion comes from the extreme kinetic energy of the fission fragments and neutrons as they fly away from the original uranium nuclei, and also includes heat and high-energy gamma ray production, which are emitted at the same time. The ultimate source of all this energy is the tiny amount of the original atomic mass that is lost as pure energy during the fission process. This mass loss is due to the small differences in mass that subatomic particles display when they are present in different elements. In other words, the mass of the neutrons and protons in the nucleus of a U-236 atom is slightly different than the mass of the protons and neutrons in its fission products. This mass difference is due to a slight difference in the binding energy that protons and neutrons have in different elements. No protons or neutrons are actually lost during the fission process, just a small amount of their mass. In addition, the mass of a neutron in the nucleus of U-236 is slightly different than the mass of the ejected neutrons that are produced during the fission event. All of these mass differences are called the mass defect of an element. When mass is lost in this fission process it is converted into at least 3 forms of energy; the kinetic energy of the particles as they are propelled away at extreme velocities, the intense heat energy which excites the surrounding atoms to millions of degrees in an instant, and the emission of broad-spectrum electromagnetic energy (light), some of which is emitted in the form of high-energy gamma rays (high frequency light). Incredibly, the destructive force at the core of a fission bomb is only a fraction of that present in a so-called hydrogen bomb. Consider this: Where a conventional explosion is used as the detonator for an atomic or fission bomb, the fission bomb itself is used to detonate a hydrogen or fusion bomb! Fusion is the process of combining two nuclei to form a heavier element—just the opposite of fission. It is fusion that provides the energy to drive stellar phenomena such as the energy production of our sun and other stars. Where a fission bomb is somewhat limited as to its potential size because the uranium nuclei must be kept in close enough proximity to allow the chain reaction to develop, a fusion bomb has essentially no upper bounds. In a fusion warhead (also called a thermonuclear device), the central core consists of deuterium and tritium surrounded by a Styrofoam explosive. Deuterium is the element hydrogen but with one added neutron, and tritium is hydrogen with two added neutrons (normal hydrogen has no neutrons, just a proton in its nucleus). When a fission bomb is exploded to detonate the fusion core, the styrofoam explosive becomes compressed inward toward the deuterium and tritium layer. This raises the temperature of the core to around 20 million degrees Fahrenheit under incredible pressures, which causes the fusion reaction to suddenly begin. The fusion process itself involves an atomic merger of deuterium and tritium to produce helium, initially forming an unstable helium isotope containing two protons and three neutrons, which then violently decomposes with the release of a neutron forming natural helium. (see illustration). The escaping neutrons are in turn absorbed by another layer of uranium 235 to produce yet another fission explosion. Thus, a thermonuclear device is really four bombs in one: first a conventional explosion, then a fission reaction, then a fusion event, and finally a second fission reaction—all of which produce explosive energy. Of the four stages, however, it is the fusion reaction that by far results in the greatest energy yield. The majority of its destructive force is created from the quantity of energy which is released when two nuclei fuse to become one. At first, a fantastic amount of energy is needed to bring the hydrogen nuclei close enough together to overcome the natural repulsion of their positively charged protons. Once they have reached close enough proximity to bind, however, the strong force which holds the nuclei of atoms together can take over and keep them bound. In order for the fusion process to be completely successful, a quantity of energy must be liberated from the incoming nuclei. If this energy were not released, the particles would be too energetic to stay together. They would simply bounce apart like colliding balls. Once they come close enough together, however, a phenomenon of nature causes the nuclei to suddenly drop down to a lower quantum energy level and release their excess energy mainly in the form of extreme heat. It is this liberated energy that causes the tremendous destructive effects of a thermonuclear blast. In fact, the temperatures that are created at the center of the fusion fireball are so great that in the entire universe only in rare supernovae stellar events are they ever equaled. The outflow of energy instantly heats the surrounding atmosphere and other nearby matter to levels far beyond what is capable by merely burning materials. The atoms and molecules become so energetic that they fly apart at high velocity and emit intense light as their electrons are driven into higher orbitals and release this energy in the form of electromagnetic waves and heat. The blast of a thermonuclear device is like suddenly having a piece of a supernova appear on the Earth. It causes an explosive discharge of heat in an expanding fireball and thermal pulse that destroys everything in it path—vaporizing anything nearby and instantly igniting combustible materials much farther away from the fireball core. Because of this fusion process, a thermonuclear explosion can easily have a yield in the megaton range whereas fission-based weapons typically have yields only in the kiloton range. In fact, some thermonuclear bombs have been detonated in tests that have had yields exceeding 10 MT. 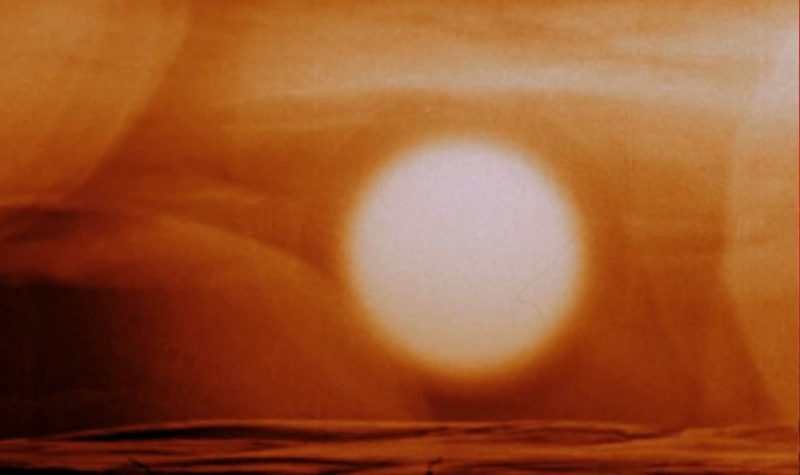 The largest hydrogen bomb ever tested was the Russian Tsar Bomba that was exploded in 1961, which had a yield of approximately 50-58 MT and was 1,350-1,570 times more powerful than both the Hiroshima and Nagasaki bombs combined. See the accompanying video for an amazing glimpse of this power from many miles away. Today, the superpowers have in their arsenals nuclear weapons of more than 20 megatons capacity. As unbelievable as this might seem, a 20 megaton weapon detonated within or over a large city area would result in a fireball and thermal pulse so huge that people would get second degree burns at a radius of over 28 miles from ground zero, which corresponds to a circular area of over 56 miles in diameter. From only one such bomb, therefore, as much as 2,460 square miles of the earth would be vaporized, burned, or blasted away—and that’s the destruction resulting only from the fireball and thermal pulse alone. If a 20-megaton bomb were to explode over downtown Chicago, people living in the farthest suburbs away from the city center would get second and third degree burns, and in most cases anything flammable that wasn’t initially vaporized would catch fire and burn to the ground. There is also evidence that bombs have been made with explosive yields of up to 100 MT; however, such extreme yields are not really necessary since massive damage can be done to any city with a thermonuclear weapon in the 500 KT to 1 MT range. In fact, many advanced targeted missiles containing multiple warheads have yields in the range of 500-800 KT per warhead, which is actually more than enough to decimate most major cities with a single blast. The newer strategy of using multiple warheads where each has a smaller explosive yield can be a decided advantage over the older strategy of using fewer, larger warheads in a massive attack. For instance, the use of multiple warheads from a MIRV (Multiple Independently targetable Re-entry Vehicle) missile in an attack on a large target can have the effect of blanketing a much broader region for complete destruction than a single bomb of much greater yield ever could accomplish. In this regard, 10 MIRV warheads independently targeting a city the size of New York at locations spread out over the metropolitan area could completely obliterate the entire region with fire and blast, and even include New Jersey and Long Island in the area of complete destruction. This would occur with much more devastation than a single larger blast targeting mid-town Manhattan at the population center. 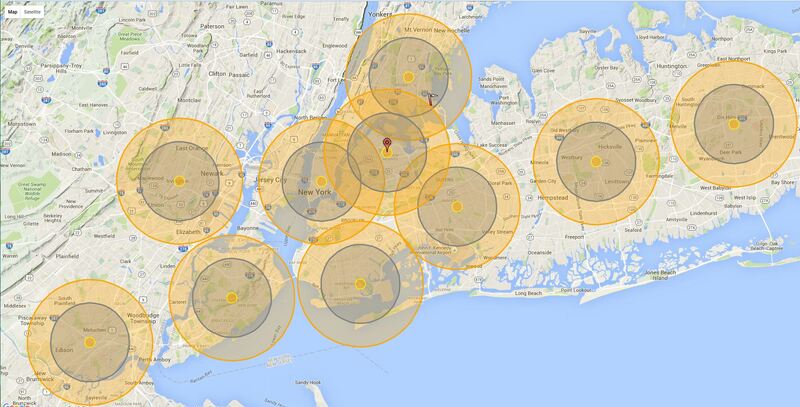 The accompanying figure shows the fire and blast effects of ten 455 KT nuclear explosions occurring across the New York area (generated by the Nucmap algorithm). 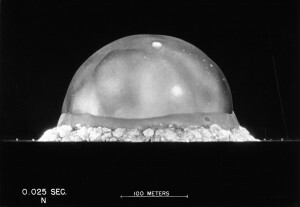 As can be seen, the region of destruction using multiple explosions of lower yield can decimate all the areas of highest population density and do so in an asymmetric manner, whereas one larger nuclear weapon would only be capable of hitting a circular region extending around the center of the single blast. The estimated fatalities from this one MIRV attack would be over 3.8 million people and with injuries estimated to be over 10.8 million. No doubt the aftereffects of fire, smoke, and radiation would greatly increase the immediate fatalities and include most people living within the region. Therefore, even though the world’s nuclear stockpiles may have been reduced over the years from their peak levels during the 1950s and 1960s, and the strategy of building ever bigger nuclear bombs has been replaced by the use of multiple smaller weapons, the effects of a nuclear exchange on civilization will still be horrendous. “The thermal pulses could subject more than six hundred thousand square miles, or one-sixth of the total land mass of the nation, to a minimum level of forty calories per centimeter squared—a level of heat that chars human beings. The Bible says in Ezekiel that the Lord will send fire upon Russia as well as many other nations throughout the world. As the final World War begins, ICBMs, cruise missiles, and heavy bombers will send nuclear fire on every military and civilian target within the warring nations. Hundreds of cities will be destroyed in a single day and civilization as we know it will cease to exist. In previous sections we had already seen that when Russia and China attack through the Middle East, weapons of fire will play a significant part in the overall destruction. Incredibly, the very regions predicted in the Bible to take part in this final conflict perfectly correlate with the countries in our day that are the main axes of global military power, and they also correspond to the key nations that have nuclear weapons capability. Only God could have accurately given these visions and predictions to his prophets thousands of years before they were to occur. The fireball and thermal pulse of an exploding nuclear bomb is a direct result of the huge amount of energy that is released by the splitting or fusing of atomic nuclei. A thermonuclear explosion occurs with a horrendous blast and fire or thermal heat that comes out of the newly formed elements in the core of the bomb. Peter could not have predicted these details any better. As the elements uranium-235 or plutonium-239 in fission-based systems reach critical mass, a runaway nuclear chain reaction emits massive quantities of neutrons and fission products. If a fusion core is also present in the warhead, then a secondary reaction also creates helium from hydrogen isotopes. Once started, the whole process continues to increase exponentially until the chain reaction consumes all the uranium within the quantity in critical mass—or it at least continues until the core within critical mass is blown apart from the ensuing blast. For a typical atomic bomb, this chain reaction takes less than a millionth of a second to complete. However, even in that brief period of time, as many as 2,000,000,000,000,000,000,000,000 (2 x 1024) atoms of uranium-235 can be split within a single warhead (Nuclear War; What’s in it for You?, Ground Zero, 1982, p. 31, Pocket Books)! This represents about 780 grams of U-235 or as little as 1.71 lbs, which actually undergoes fission in a relatively small bomb (for each pound of U-235 split the yield equals about 8 KT). And remember, only a tiny amount of that total mass is converted to energy when the bomb explodes. Despite the small amount of mass that is lost as a result of a fission or fusion reaction, tremendous amounts of energy are released. It is as if a violent fire has come out of the elements themselves, just as the Apostle Peter predicted. Of course, Peter didn’t know that the source for this energy generation would be a small amount of matter that is lost during the conversion of uranium-235 or plutonium-239 to its fission products, nor did he know that mass is lost during the fusion of hydrogen into helium. He also didn’t know about Einstein’s Special Theory of Relativity, which defines the relationship between the “frozen” energy state of matter and the “free” energy of the universe, which can be represented by E = mc2 (where E is the energy, m is the mass, and c is the speed of light). In other words, the prophet didn’t know any of the science behind this prediction, nevertheless he precisely described what will happen when the nuclear weapons of destruction rain down upon the cities of the world! It now becomes obvious that Peter’s prophecy in which he said the elements themselves would burn with fire is a perfect description of a thermonuclear explosion. So too is his mention of a great noise (the blast) and the ensuing fires, which will burn down everything that man has created. He couldn’t have described it any better unless he had our current scientific knowledge of relativity and nuclear weapons technology. Peter thus predicted that in the midst of the coming Great Tribulation the nuclear arsenals of the superpowers will be used upon the major population centers of the world, causing the release of fervent heat upon the nations. All the works of man will be burned up in a final fiery holocaust just as the Bible predicted! Seeing that end times prophecies are really coming true in our lifetime, what manner of people should we be as followers of Christ? Knowledge of the ultimate judgment and destruction of the world at the end should give every Christian a sense of urgency to get their lives in order before we meet the Lord at his Coming. The words of John the Baptist are more true now than they ever have been, as he cried, “Repent, for the Kingdom of Heaven is at hand”!